Keichousaurus is a type of marine reptile in the pachypleurosaur family which went extinct at the close of the Triassic in the Triassic-Jurassic extinction event. The name derives from Kweichow (now Guizhou Province) in China where the first fossil specimen was discovered in 1957. Keichousaurus, like all sauropterygians, was highly adapted to the aquatic environment. individuals of this genus ranged up to 2.7 m in length, and had both long necks and long tails, with elongated, five-toed feet. 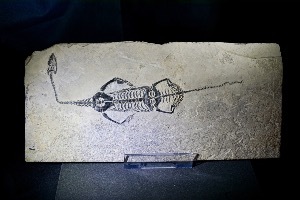 The pointed head and sharp teeth in this genus also indicate that they were fish-eaters. Some recovered specimens feature an especially developed ulna (or elbow bone, one of the two long bones in the forearm, the other being the radius) suggesting they may have spent some time on land or in marshes.